Txteagle is making it possible for many people in countries like Kenya to earn small amounts of money by completing simple tasks like translations or transcriptions. Amazon's "Mechanical Turk" similarly divides up tasks but Txteagle differs in that it distributes them via text messages over mobile phones, which have a higher penetration rate - particularly in the developing world. The service was founded by Nathan Eagle, a researcher at the Santa Fe Institute in New Mexico. "What we typically focus on is words and phrases, and at the moment most of our clients are interested in software localisation," Dr Eagle told BBC World Service's Digital Planet programme. "They approach us and say look, we have this whole slew of text-based tasks, things like translations and transcriptions." 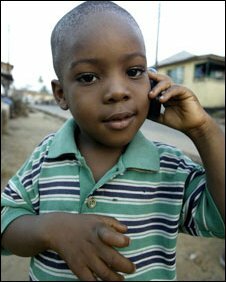 According to Txteagle, the total amount of idle time that literate, English-speaking mobile phone subscribers have within the developing world is estimated to be more than 250 million hours every day. He feels that texting tasks like simple translations to participants in developing countries is economical not only in a business sense but also provides participants with an additional source of income. "In Kenya there are 60 different unique languages, and companies - whether they are Microsoft, Google or Nokia - would love to put their software in each of these languages. "But they really have no idea what these particular words would translate to," said Dr Eagle. 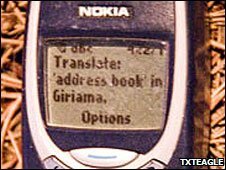 "For example, the word 'address book' is very common on almost all Nokia handsets and where I was living in this small village called Kilifi in Kenya, the mother tongue is a language called Giriama. "An individual in Kilifi receives the text message saying, please translate the word 'address book'. "They type in that particular word and it gets sent back to our server, which is collecting a lot of responses from that same task until we are confident we have the right answer. "Once we get the right answer we push it back to - in this case - Nokia. "This system enables companies like Nokia to build-up a corpus of these translations, so that they can do software localisation," he said. Although the concept seems like an ideal way of helping the developing world, Txteagle could also be seen as a means of profiteering. Dr Eagle disagrees and feels that given the high rates of unemployment and marginal income sources, much of this population would greatly benefit from even an extra dollar per day. "One of the things that we would like to see happen is to have lots and lots of tasks and have individuals potentially doing this full-time," he said. "For the moment this is something that would be a system that enables people to augment their existing income stream and not for them to quit their job and do this full time. "If you just look at the business of outsourcing industry, we're talking about hundreds of billions of dollars a year. "If we could get a small fraction of a percent of these types of tasks going into rural villages in Africa, not only can we affect the lives of a lot of people, we can impact the GDP of the nation," he added. All payments for completed tasks are received by mobile phones, using M-PESA, a popular mobile banking service. "I would love to be able to come up with a way that we can do much larger scale translations, but remember we are constrained by this 160 character text message limit," said Dr Eagle. He is hoping to expand the service to enable a single phone to have multiple user accounts, so that family members could each use a shared phone to create their own individual savings accounts. Txteagle is set to be rolled out in the Dominican Republic and South America later this year. Digital Planet is broadcast on BBC World Service on Tuesday at 1232 GMT and repeated at 1632 GMT, 2032 GMT and on Wednesday at 0032 GMT. You can listen online or download the podcast.